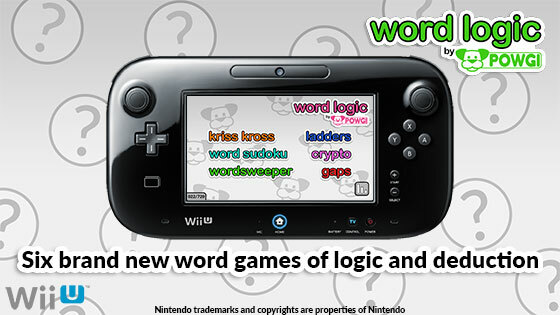 Six more more POWGI word puzzles are coming to Wii U™ in this brand new collection! This compendium focuses on puzzles that are solved using logic and deduction. The classic word-fit puzzle. Place words into the grid using their length as a guide, and using logic to make sure everything overlaps correctly! Make new words by changing one letter at a time. Can you turn one word into another in a limited number of steps? A cipher puzzle (also known as a cryptogram) which reveals a quote when you crack the code! Place nine letters according to usual sudoku rules. As an extra clue, one row or column will spell a word. Several words have one letter missing. Deduce the correct letter to fill in the gaps and spell a new word! Drawing inspiration from Minesweeper, the clues tell you which letters can be placed in an adjacent square. It’s a crossword-style puzzle solved using logic! Release date: August 18th 2016. Games developed and published by Lightwood Games under license.